One of the most remarkable and well-known conversions in the history of the Christian faith is found in the story of St. Augustine. As a brilliant young man and accomplished philosopher, Augustine’s intellect brought him farther along than most of the men in his day, and his weakness for the sins of the flesh brought him further from God than he could have possibly imagined. In this regard, the sorrow and bitter tears of his mother, St. Monica, are iconic. She spent entire years of her life weeping for his conversion and crying out to God, and anyone else who would listen, if only someone could convince her son how desperately he needed God. Monica believed that her son’s willful separation from God and his sinfulness, if unchecked and unchanged until death, would result in the loss of eternal life (one of the great tragedies of our culture is that there are no longer as many Monica’s who weep and lament the possibility of such things, but that is another homily for another time). Augustine himself would later concur with the conviction of his mother when, in his autobiography, The Confessions, he expresses in great detail the human drama of being utterly lost and the divine humility that sought him out with breathtaking and undying love. At one point in his own story of conversion Augustine relates how, although he had come full circle on an intellectual level with regard to the Christian faith and had begun to surrender his heart to God in earnest, he found himself at an impasse when it came to leaving behind the sensual pleasures that had so captivated him as a young man. Indeed, earlier he had openly admitted that he was “a slave of lust” (The Confessions, Book VI, 15.25). Late now, but not too late, he became enamored of the desire to be set free. Augustine relates how he was held back by vivid memories and the weight of all that he was to leave behind. He could certainly imagine himself becoming fully immersed in God some time in the future, but he lamented the inability to do so presently. Overcome by emotion, he burst out of the house in which he was staying and sat down in an adjoining garden. His face wet with tears, Augustine began to pray to God, “Why not now? Why do I not put an end to my shameful conduct from this hour forward?” (The Confessions, Book VIII, 12.28). At that very moment he began to hear the sound of a child’s voice from a nearby house. The voice was playfully singing, “Tolle, legge. Tolle, legge,” Latin for “Pick it up and read it. Pick it up and read it.” He paused and tried to think if he had ever heard of a child’s game that used those words; if there was one, he could not recall it. All the while that child’s voice continued melodiously: Tolle, legge. Tolle, legge. You know the time; it is the hour now for you to awake from sleep. For our salvation is nearer now than when we first believed; the night is advanced, the day is at hand. Let us then throw off the works of darkness and put on the armor of light; let us conduct ourselves properly as in the day, not in orgies and drunkenness, not in promiscuity and lust, not in rivalry and jealousy. But put on the Lord Jesus Christ, and make no provision for the desires of the flesh. From this moment forward St. Augustine would have the strength provided by God to embrace the call of God not only of chastity but also of celibacy for the Kingdom of God. 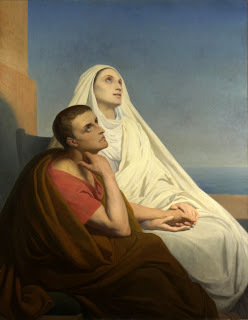 His mother, St. Monica, had prayed fervently that he would be baptized a Christian and be able to embrace a life of chastity but she never imagined that he would become a priest and finally a bishop. In a moment of grace St. Augustine had become awake and alive to all that God was calling him to. “You know the time,” St. Paul urges us on. “It is the hour now for you to awake from sleep. For our salvation is nearer now than when we first believed; the night is advanced, the day is at hand” (Romans 13:11). Advent is about waking up to the presence of God in our lives and being alert to the power of God that transforms us and, through us, transforms the world around us. Are we awake and alert for that? Jesus Christ, in our Gospel this weekend, warns us not to be spiritually slothful, like the people in the days of Noah. They were totally occupied with marriage, eating, drinking, celebrating—all good things, no doubt—but they let themselves be distracted from the unum neccesarium, the one necessary “thing”: God. “Therefore, stay awake! Jesus warns us. “For you do not know on which day your Lord will come” (Matthew 24:42). When the Lord came to Bethlehem, and then to Galilee and Jerusalem, so very many people missed Him. When he comes again, the Sacred Scriptures tell us, many will be spiritually asleep. When he comes to us this Christmas, will we be awake? The Latin word for “coming” is Adventus. It is where we get the name for this season of preparation for the coming of Christ in just a few short weeks. I would suggest this weekend three particular tried-and-true ways that we can be more fully awake and alert for Jesus Christ this Advent. They come to us from the lives of the saints and have stirred the souls of Christians for centuries. They may already be a part of your daily spiritual regimen, but we can always use a reminder. Lord Jesus Christ, I offer You all the prayers, works and sufferings of this day for all the intentions of your most Sacred Heart. It can be that simple, but also that meaningful, for us and for God. We are saying to God that all the good we will accomplish—our prayers and works, our gifts and achievements, our virtues and victories—are being offered to Him, in faith, in advance. Also, we are saying that all the challenges and crosses we will encounter—our sufferings, our setbacks, the contradictions that we may never have anticipated—are all being offered to Him in faith, as well. “I am awake for you today, Jesus. All day.” What a beautiful way to wake up to God each day! Secondly, I would suggest that we take a page from St. Augustine’s book, literally! Tolle, legge! Take it up and read it! The prayerful reading of Sacred Scripture has been the staple of the saints from the inception of the Church until now. Perhaps we could begin with just a minute or two each day, taking up the Bible and slowly letting it shape and form us, speaking to God whatever comes to mind when we spend that time with Him in the Sacred Scriptures. One passage from the Letter to the Romans was able to transform St. Augustine and make him fully awake and alive in Christ. Imagine what God’s word will do in our lives this Advent! Finally, I would recommend the Daily Examen. Not only at the beginning of the day but at the end of each day we follow the example of the saints who come before God each evening and take two minutes to review the time that has transpired since that Morning Offering. For one minute, think of those several things for which you are grateful, or of graces that you were most open to, or moments that God touched your life in a significant way. It might be that friend you encountered at the market or the difficult errand that was accomplished without a hitch; it might be your health or your family or some other grace. Next, we take a moment to think of those times in which we were not as awake or alert to the presence of God as we could have been. We think of those sins that have perhaps set us back or moments of weakness where we said or did something for which we are sorry. We bring our repentant hearts before God, seeking His mercy and forgiveness, which is so totally abundant and resplendent whenever we turn to Him. These methods and practices of our Christian lives sound so simple and basic but they have the power to profoundly open our hearts to God, making us alive, alert and awake in Jesus Christ. And that is the point of Advent. Jesus Christ wants to wake us up and fill us with His life and grace, so that we can then go out and bring His presence to all those we encounter this week. There are so many people—perhaps people we meet on a daily basis—who may never walk into the Catholic Church this Advent. 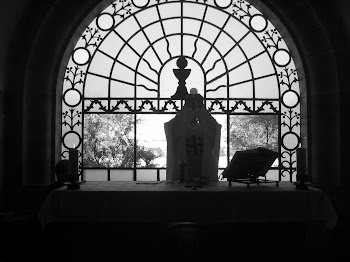 Perhaps they are afraid that they are not truly loved by God or have done something in their lives that could never warrant forgiveness; perhaps they do not believe that there is anything in the Church for them or that their lives are sufficient without God or His Church; perhaps they are so busy and occupied that they cannot imagine something so remarkably awesome and super-substantial as the Eucharist being the greatest experience of their earthly existence. Whatever the case may be, you and I may be the most radiant and real experience they will have of the presence of God this Advent. But that can only happen if we are fully awake and alive in Christ. May this Advent find us watchful and ready for the coming of Jesus Christ into our lives, and then through us, into the lives of all we encounter this Advent season.